Violinist Chloe Meyers is concert master of Vancouver’s Pacific Baroque Orchestra, as she has recently made her home in the Pacific Northwest. In pursuit of her professional studies at both the University of Victoria and McGill University in Montreal, she was introduced to, and fell in love with, the baroque violin. 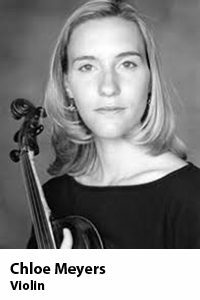 Chloe has regularly played principal second with Montreal’s Arion Baroque Orchestra and has been an invited guest soloist with the Seattle Baroque Orchestra and Pacific MusicWorks. Chloe has performed with, among others, Les Violons du Roy, Tafelmusik, the Montreal Symphony Orchestra, Ensemble Les Boréades, the Theatre of Early Music and Les Idées Heureuses. She played first violin on a Juno Award winning recording of Handel arias featuring Canadian soprano Karina Gauvin on the Atma Classique label.